We are starting the Blogging Marathon # 14 today and I am excited that I will be sharing my favorite dishes of all – the ever tempting Dosas. I have always professed my love to Dosas. Which is why I started on a series on 101 Dosa Varieties, hoping to cover many varieties and more. Towards that I even had my first blog event, Dosa Mela some four years back. It was heart warming to find and reach out to so many Dosa lovers. Since then I have been updating my list, yet I know I have covered only about 48 of Dosa Varieties. I decided that having Dosas as a BM theme, will surely get me into action. Before that a small update on the group running this BM with me. It is again split into two weeks, a total of 30 bloggers are doing the Marathon with me, with about 20 of them doing the first week and 25 doing the second week. This edition I thought I will restrict each theme to a four member group and introduce a 3 theme combo for those who want to do the second week also. We have about five new bloggers joining us. I am all geared up to read and enjoy what’s going to be dished up this edition too. I hope you will enjoy this run too, please be sure to check out the action. Coming back to the first recipe in the series, I took out my huge recipes bookmarked and collected over many years. I found this Maida dosa to be very interesting. On reading further, I realized it can be called a coconut dosa also as it uses coconut more too. It’s very different to the Coconut Dosa I have already posted. Basically when you think of Dosa, you will naturally think of the Rice, Urad dal combo that’s ground and fermented to be used. 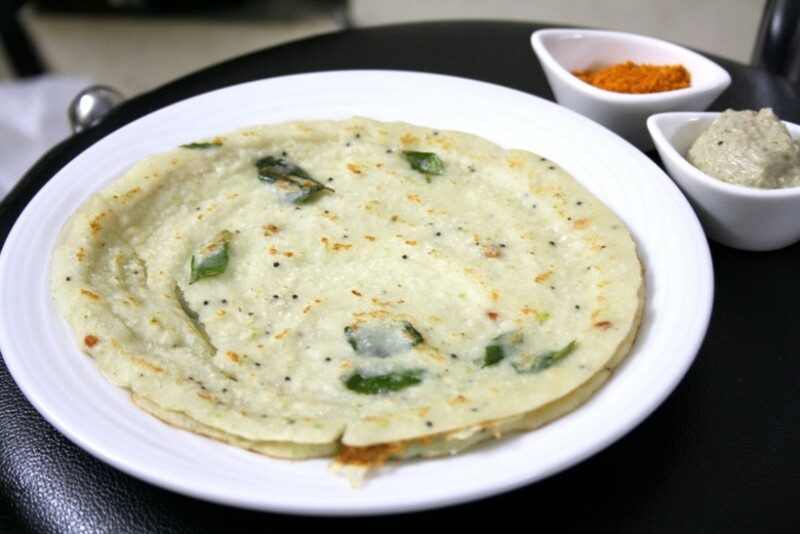 Apart from that, there are so many Instant Dosas that can be made and enjoyed. I almost thought I might not be able to do the BM this time as I didn’t have anything ready. So I had to fall back on this no fermented Dosa, and then plan for other versions. When I planned and got the batter ready for 3 different posts, I literally saw that we were overflowing with dosa batters at home. Even though I had warned hubby dear that he might be subjected to an overdose of dosas, I even alerted parents on this fact that their share of batter will be shipped up! Yet I decided we should finish up with these batches before moving on to make the next set of dosa recipes. Though the original recipe was called this All purpose flour Dosa, I prefer to call it Maida Coconut Dosa. For this edition I am going to share some instant non fermented Dosas, along with those famous fermented varieties from different states. 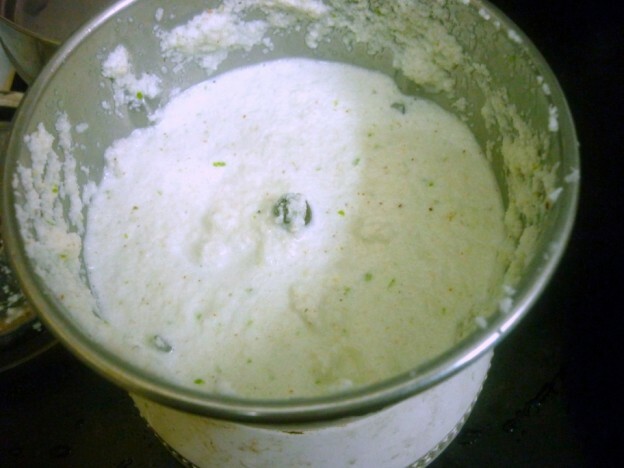 Grate the coconut and in a mixer, take the coconut along with green chillies, Ginger, Salt. 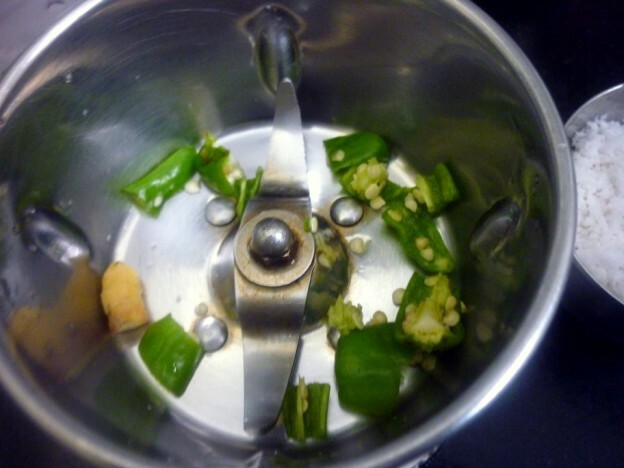 Pulse it couple of times, then add little required water to get a smooth paste. 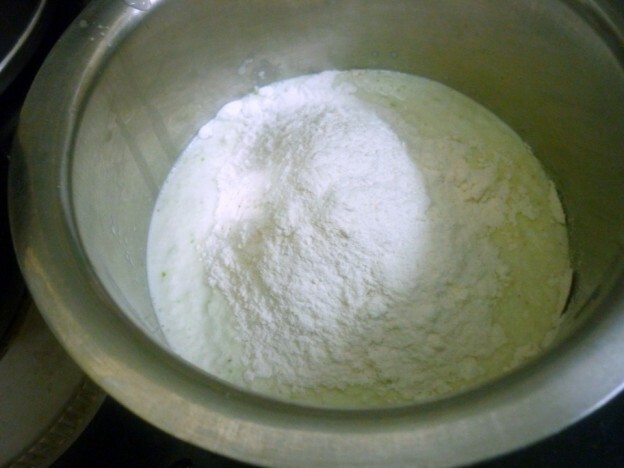 Transfer this paste to a bowl, add all purpose flour to this mixture. Slowly add water and mix to get a batter without any lump. Season it with oil, Mustard seeds and curry leaves. 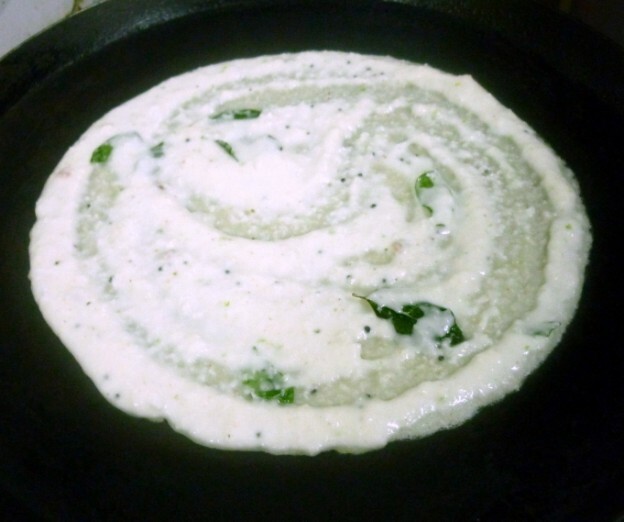 Heat a tawa and pour a ladleful of batter as you do with regular dosa batter and spread out. Sprinkle oil and cook on both sides. 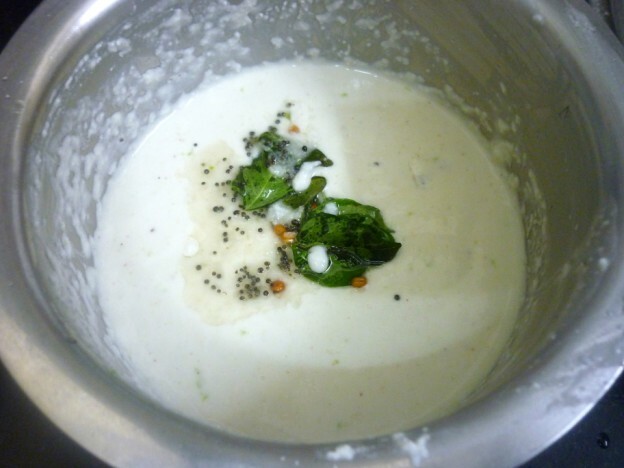 Serve with either coconut chutney / groundnut chutney. Since our constant chutney that gets paired with all dosas is always groundnut chutney, it was made as the side dish along with Pappula Podi, our authentic Andhra condiment. This Pappula Podi was specially imported from my colleague from Guntur. She has come down to visit us and got this along. I couldn’t miss out getting myself a pack of it. 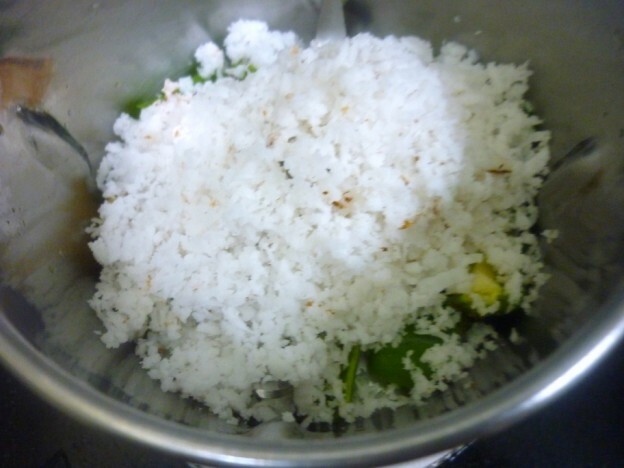 This is very similar to what Athamma makes, though it was little more on the spicier side. With the dosa tasting nutty with coconut, it was so delicious with ghee mixed pappula podi. I was so happy knowing that Daddy loved this dosa with the chutney. This is surely something that will be made again. That's a very interesting instant dosa Valli. Adding coconut sounds delicious. Looking forward to ur dosa recipes this week. Instant recipes always saves my day whenever I have unexpected guests at home. This is really a quick n easy recipe it reminds me of my mom making similar pancakes, her recipe calls for grated potatoes instead of coconut. Ha ha,same case here Srivalli.The fridge holds different versions of dosa batter and mom is having a hard time finding place to keep other stuffs inside :). Mom prepared another version of maida dosa but without coconut.Must try this one soon. The step by step recipe for the dosa looks so interesting Srivalli and al sure the coconut and tempering really adds to the flavour of it. Will try this one. I will have to book mark these instant ones..the fermented ones cause acidity …n surely these wud be appreciated by the family. 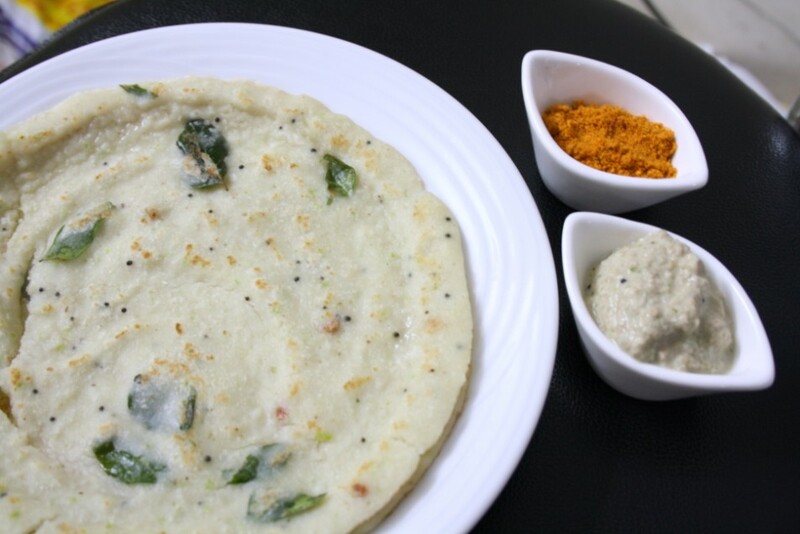 Nice instent dosa recipe with maida Valli I use to make coconut dosa with rice flour will try with maida next time. I do make coconut dosa, Mangalore style, I have not used Maida though., must try sometime.., I don't do instant dosa's much though. Love that coconut masala going in the batter!!! Must be very flavorful!!! This goes straight into my to-do list!!! Never made a dosa just with maida flour. Very interesting one Valli. quick and nice.. I also make it similarly ! What is the type/name/style of the mixer/blender/grinder you are using? I received an Ultra+ for xmas this year but it doesn't have the blades.